Here is a success story of a group of 10 bochurim. 10 sets of parents and two devoted Rabbeim who knew that they had to walk through fire, give up precious hours, turn their pockets inside out and have Siyata Sishmaya from the one above. Who just needed the opportunity. Thus, Yeshivas Shaagas Aryeh was founded. An opportunity to bring to our and hopefully other communities a yeshiva which focuses on giving Bochurim a natural Ahavas Hatorah. An environment where boys are encouraged to expand their torah learning even outside the regular yeshiva hours. Where learning is not just for education but also for enjoyment and a way to bring you closer to Yiddishkeit. Where the Rebbeim focus on each student as an individual and help them rise above their challenges to flourish. Our vision for the Yeshiva is to continue to grow by expanding enrollment into a second year. Hiring additional staff and adding programs we know the Bochurim would benefit from tremendously. 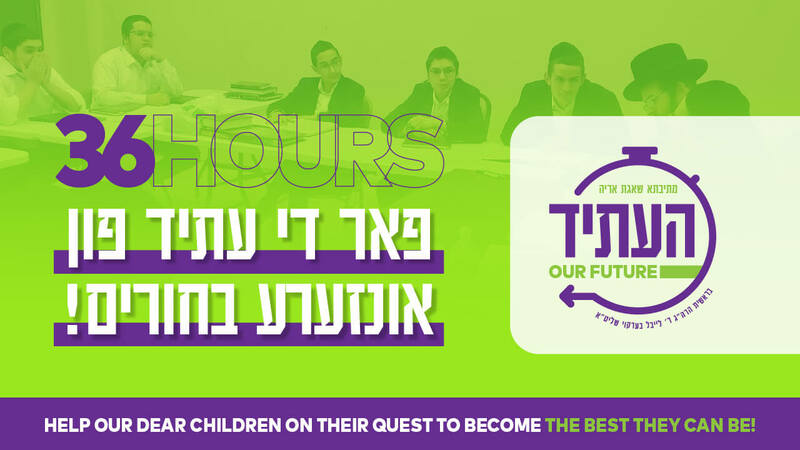 Our dream is to build a Yeshiva with a Dormitory, a full gym, pool and various programs around the clock which will keep the Bochurim engaged and entertained 'Al Taharas Hakodesh'. We need YOUR help to continue this holy mission and to expand and grow to serve many more from our and other communities as well. Can this become a reality? Click "Donate Now" for a future you helped build!